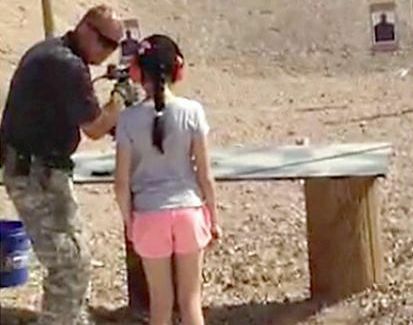 An instructor who was shot by a 9-year-old girl who fired an Uzi at a northwestern Arizona shooting range died Monday night at University Medical Center in Las Vegas. The Mohave County Sheriff’s Office said the accidental shooting occurred about 10 a.m. Spokeswoman Trish Carter said the girl, who was vacationing from New Jersey with her parents, was standing next to the instructor at the time. Mohave County Sheriff Jim McCabe described a video taken of the accident as “ghastly.” His office released a short video of the girl taking her first few shots. He said the girl safely and successfully fired the 9 mm weapon several times when it was set in the “single-shot” mode. He said the weapon was put into the “fully-automatic” mode before the girl fired again with the instructor standing off to her left. The weapon recoiled and drifted left as the girl squeezed off an undetermined number of rounds as she maintained possession but lost control of the Uzi as it raised up above her head. “The guy just dropped,” McCabe said of shooting instructor Charles Vacca, 39, of Lake Havasu City, who suffered at least one gunshot to the head. Jeff Frichette, director of training for The Range 702 in Las Vegas, said the incident in Arizona would never occur at his business. He credited this to how continuously shooting range’s safety officers are trained. That decision is based on physical and safety guidelines, he said.